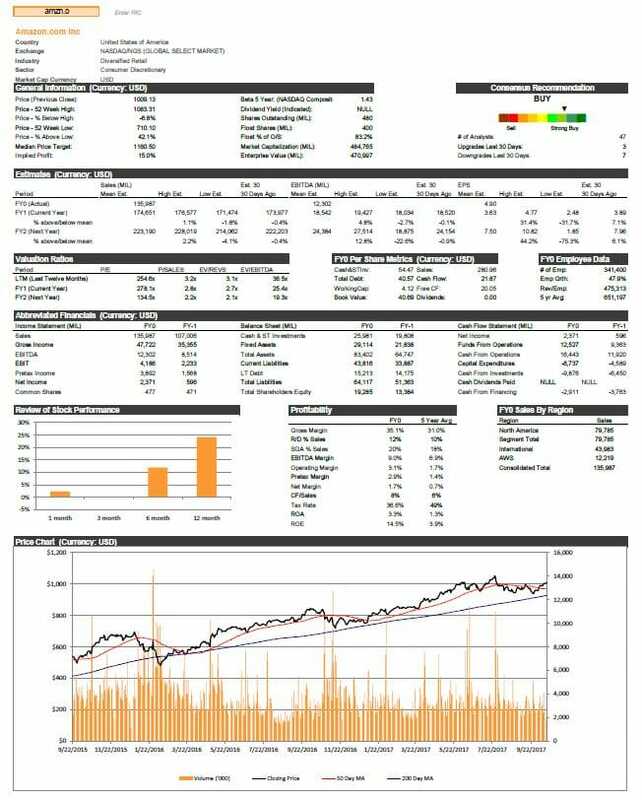 In the world of finance, a tear sheet provides a one-page summary of the company with information such as Market PriceTechnical Analysis - A Beginner's GuideTechnical analysis is a form of investment valuation that analyses past prices to predict future price action. Technical analysts believe that the collective actions of all the participants in the market accurately reflect all relevant information, and therefore, continually assign a fair market value to securities., 52-week High and Low, Market Capitalization, Enterprise ValueEnterprise ValueEnterprise Value, or Firm Value, is the entire value of a firm equal to its equity value, plus net debt, plus any minority interest, used in valuation. It looks at the entire market value rather than just the equity value, so all ownership interests and asset claims from both debt and equity are included., Analyst Recommendation, Revenue, EBITDA,EBITDAEBITDA or Earnings Before Interest, Tax, Depreciation, Amortization is a company's profits before any of these net deductions are made. EBITDA focuses on the operating decisions of a business because it looks at the business’ profitability from core operations before the impact of capital structure. Formula, examples Valuation, Workforce Size, Share Price Movement, etc. Tear sheets are also known as “Fact Sheets” and help an investor understand the financials and prevailing valuations of a public company. The term Tear Sheet is derived from an old practice when stockbrokers used to tear and give a sheet to the investor as a stock recommendation. Basic Financial Profile – The topmost section of the sheet gives general information about the company’s stock such as the last closing price, 52-week high and low, market capitalization, total shares outstandingWeighted Average Shares OutstandingWeighted average shares outstanding refers to the number of shares of a company calculated after adjusting for changes in the share capital over a reporting period. The number of weighted average shares outstanding is used in calculating metrics such as Earnings per Share (EPS) on a company's financial statements, enterprise valueEnterprise ValueEnterprise Value, or Firm Value, is the entire value of a firm equal to its equity value, plus net debt, plus any minority interest, used in valuation. It looks at the entire market value rather than just the equity value, so all ownership interests and asset claims from both debt and equity are included., the beta of the stockUnlevered Beta / Asset BetaUnlevered Beta (Asset Beta) is the volatility of returns for a business, without considering its financial leverage. It only takes into account its assets. It compares the risk of an unlevered company to the risk of the market. It is calculated by taking equity beta and dividing it by 1 plus tax adjusted debt to equity, etc. The basic idea is to get a good understanding of the valuationValuationValuation refers to the process of determining the present worth of a company or an asset. It can be done using a number of techniques. Analysts that want of the company and the range the stock price trades in. Analyst Recommendation – It shows the number of equity research analystsEquity Research AnalystAn equity research analyst provides research coverage of public companies and distributes that research to clients. We cover analyst salary, job description who are tracking the stock and their expectations on its performance. The analysts do an in-depth evaluation of the company, including its valuation, to come out with an equity research report and comment whether it’s time to buy or sell. Some of the popular analysts include Goldman Sachs, Morgan Stanley, Piper Jaffray, Credit Suisse, Jefferies, Barclays, etc. Estimates – This section gives the analysts’ mean estimates with respect to sales, EBITDAEBITDAEBITDA or Earnings Before Interest, Tax, Depreciation, Amortization is a company's profits before any of these net deductions are made. EBITDA focuses on the operating decisions of a business because it looks at the business’ profitability from core operations before the impact of capital structure. Formula, examples, and EPSEarnings Per Share (EPS)Earnings per share (EPS) is a key metric used to determine the profit for the common shareholder's on a per share basis. Earnings per share measure each common share’s profit allocation in relation to the company’s total profit and can be calculated based on basic shares outstanding or fully diluted shares outstanding. It also shows the highest and lowest estimates as per analyst research reportsEquity Research OverviewEquity research professionals are responsible for producing analysis, recommendations, and reports on investment opportunities that investment banks, institutions, or their clients may be interested in. The Equity Research Division is a group of analysts and associates. This equity research overview guide. Valuation Ratios – It is something that is very important from an M&A perspective, as it measures the key ratios for comparison purpose. It gives ratios like P/EForward P/E RatioThe Forward P/E ratio divides the current share price by the estimated future (“forward”) earnings per share (EPS). For valuation purposes, a forward P/E ratio is typically considered more relevant than a historical P/E ratio. 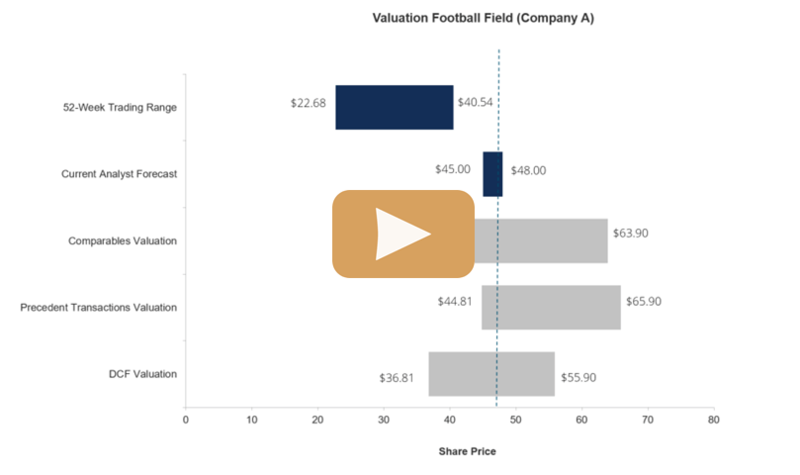 P/E ratio example, formula, and downloadable Excel template., EV/Revenue, EV/ EBITDAEV/EBITDAEV/EBITDA is used in valuation to compare the value of similar businesses by evaluating their Enterprise Value (EV) to EBITDA multiple relative to an average. In this guide, we will break down the EV/EBTIDA multiple into its various components, and walk you through how to calculate it step by step based on last year, current year and on the next year’s estimatesIBES EstimatesThe IBES or Institutional Broker’s Estimate System is a database created to provide forecasted future earnings of companies that are publicly traded.. Employee Data – It contains information like the total number of employees, employee growth, and revenue per employee. Revenue/Employee will generally be higher in product companies compared to service industries as they rely more on human capital. Abbreviated Financials – It gives a bird’s eye view of all three components of financial statementsHow the 3 Financial Statements are LinkedHow are the 3 financial statements linked together? We explain how to link the 3 financial statements together for financial modeling and valuation in Excel. Connections of net income & retained earnings, PP&E, depreciation and amortization, capital expenditures, working capital, financing activities, and cash balance. It contains the income statement, balance sheet, and cash flow statement. It gives the overall numbers that are relevant for a quick analysis such as sales, gross profit, EBITDA, pretax income and net income. The Balance Sheet contains details about fixed assets, cash, total assets, long-term debt, current liabilities and shareholders’ equity. It also contains break-up of cash flow from operating, investing and financing activities, which is crucial to understanding the company’s cash flowValuationFree valuation guides to learn the most important concepts at your own pace. These articles will teach you business valuation best practices and how to value a company using comparable company analysis, discounted cash flow (DCF) modeling, and precedent transactions, as used in investment banking, equity research,. Stock Performance – It shows the return generated by the stock over 1-month, 3-month, 6-month and 12-month periods. Profitability – There are the various measures of profitability (such as net incomeNet IncomeNet Income is a key line item, not only in the income statement, but in all three core financial statements. While it is arrived at through the income statement, the net profit is also used in both the balance sheet and the cash flow statement.) that are important to different industries. A complete snapshot of the same is given for a quick analysis. The kind of return generated on assets and equity is also given with 5-year average to provide insights on historical performance. Sales by Region – This shows geographical mix, i.e. what region where the company is getting what percentage of total salesSales RevenueSales revenue is the starting point of the income statement. Sales or revenue is the money earned from the company providing its goods or services, income. Price by Chart – The last chart shows stock price movement over a 2-year period with the volumes of trade and 50-day and 200-day moving average.